Review: The dwarves, Bilbo Baggins and Gandalf the Grey continue on their journey to reclaim Erebor. 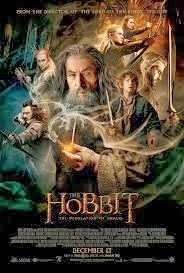 The only criticism that I have with this film is that just like the first Hobbit film I found it to be too long. There could have easily been half an hour taken out. A lot darker than the first film. Ian McKellen wasn’t in it as much as I thought he would be. I thought he would have a bigger more important role to play. The Visual Effects were brilliant in this. For me Martin Feeman made the film. His character and expressions were faultless. There were one or two scenes that did make me smile and laugh. Benedict Cumberbatch did a fantastic job doing the voice of the dragon. As good as The Hobbit films are they won’t be nominated / win any Golden Globe or Oscar awards like The Lord of the Rings.